From 1988 to 1993, "The Wonder Years" was one of TV's biggest hits. 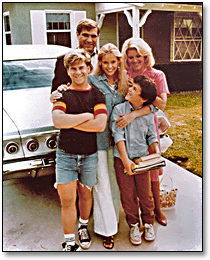 On the show, Fred Savage (as 'Kevin Arnold') and the rest of the Arnold family lived in a typical house in quiet, middle-class suburb during the late 1960's. That 'Arnold house' is actually located in northeast Burbank (not far from the Media Center mall), at 516 University Ave., about a mile and a half east of the Burbank/Bob Hope Airport. The 1990s brought us the popular sitcom "The Fresh Prince of Bel-Air", which introduced Will Smith to middle America. 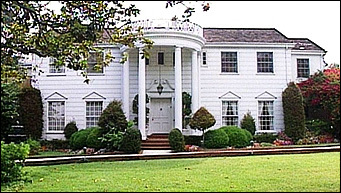 The mansion Will lived in, with the Banks family, is located at 251 N. Bristol Ave, in Brentwood, not in neighboring Bel-Air. Located at the southwest corner of Bristol and Parkyns Street, two blocks north of Sunset Blvd, it's not easy to see from the street, as it's mostly hidden by a wall of bushes & trees. The familiar office tower seen in NBC's "L.A. LAW" is actually located in downtown L.A., at 444 Flower Street. It's called the"444 Building," and it's at the southeast corner of 4th & Flower, right across the street from the Bonaventure Hotel. "704 HAUSER" was Archie Bunker's old address on "All In The Family," and it was also the name of a short-lived 1994 sitcom (starring John Amos and T.E. Russell.) "Archie Bunker" himself, actor Carroll O'Connor, says that he came up with the address for the Bunker family residence (704 Hauser Street) when he was driving to work in L.A. He happened to find himself on Hauser Boulevard (just a few blocks east of CBS TV City), and thought the name sounded like part of Queens, where Archie was supposed to live. In the TV series "QUANTUM LEAP," you may remember a scene where Sam time traveler (Scott Backula) "leaps" into the body of an African-American man in the Old South, and attempts to vote in an election. He comes to the porch of an old Southern mansion, only to be turned away. Remember when MTV's "THE REAL WORLD" house was in Los Angeles? Or more specifically, in Venice, CA? It was the show's second season, in 1993, and some of the house residents were Jon, Tami, Beth, Dom, Irene Aaron and David (who got kicked out for pulling the covers off Tami). The address of that house was 30 30th Street, Venice, and it is just steps from the beach. In the soap opera "GENERAL HOSPITAL", most of the action takes place on the 7th floor of "Port Charles Hospital." But the familiar hospital shown in exterior shots is actually the County/USC Hospital (at 1200 N. State Street), in East L.A. The 1994 TV-movie "TONYA & NANCY: THE INSIDE STORY" " was the first of several TV epics about the Tonya Harding/Nancy Kerrigan scandal. Its Olympic ice skating scenes, supposedly set in Lillehammer, Norway, were actually shot a few miles east of Disneyland, at the Honda Center (then known as "The Arrowhead Pond"), where Anaheim's pro-hockey team, The Ducks, play their games. It's located at 2695 E. Katella Avenue, in Anaheim. Bette Midler filmed her 1994 re-make of "GYPSY" (a CBS made-for-TV-movie musical) in downtown Los Angeles, at the old Orpheum Theatre (at 842 S. Broadway). The 1990 made-for TV movie "THE DREAMER OF OZ," cast John Ritter as L. Frank Baum, author of "The Wonderful World of Oz." 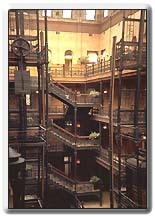 In the movie, Ritter spends a much of his time in the ornate, turn-of-the-century offices of his publisher.